Born in 1476; died 1544; beatified in 1710. Already very early it became evident to her pious Italian family that this child was set for something unusual in life. When Lucy was five years old, she had a vision of the Child Jesus with Our Lady. Two years later, Our Lady appeared with Child Jesus, Saint Catherine of Siena and Saint Dominic. Jesus gave her a ring and Saint Dominic gave her the scapular. At age 12, she made a private vow of total consecration, determined, even at this early age, to become a Dominican. However, family affairs were to make this difficult. Next year Lucy's father died, leaving her in the care of an uncle. And this uncle felt that the best way to dispose of a pretty niece was to marry her off as soon as possible. The efforts of her uncle to get Lucy successfully married form a colorful chapter in the life of the Blessed Lucy. At one time, he arranged a big family party, and his choice of Lucy's husband was there. He thought it better not to tell Lucy what he had in mind, because she had such queer ideas, so he presented the young man to her in front of the entire assembly. The young man made a valiant attempt to place a ring on Lucy's finger, and he was thoroughly slapped for his pains. The next time, the uncle approached the matter with more tact, arranging a marriage with Count Pietro of Milan, who was not a stranger to the family. Lucy was, in fact, very fond of him, but she had resolved to live as a religious. The strain of the situation made her seriously ill. During her illness, Our Lady appeared to her again, accompanied by Saint Dominic and Saint Catherine, and told her to go ahead with the marriage as a legal contract, but to explain to Pietro that she was bound to her vow of virginity and must keep it. When Lucy recovered, the matter was explained to Pietro, and in 1491 the marriage was solemnized. Lucy's life now became that of the mistress of a large and busy household. She took great care to instruct the servants in their religion and soon became known for her benefactions to the poor. Pietro, to do him justice, never seems to have objected when his young wife gave away clothes and food, nor when she performed great penances. He knew that she wore a hair-shirt under her rich clothing, and that she spent most of the night in prayer and working for the poor. He even made allowances for the legend told him by the servants, that SS Catherine, Agnes, and Agnes of Montepulciano came to help her make bread for the poor. Only when a talkative servant one day informed him that Lucy was entertaining a handsome young man, who seemed to be an old friend, Pietro took his sword and went to see. He was embarrassed to find Lucy contemplating a large and beautiful crucifix, and he was further confused when the servant told him that the figure on the crucifix looked like the young man he had seen. But when, after having disappeared for the entire night, Countess Lucia returned home early in the morning in the company of two men and claimed that they were Saint Dominic and John the Baptist, Pietro's patience finally gave out. He had his young wife locked up. Here she remained for the season of Lent; sympathetic servants brought her food until Easter. Being allowed to go to the church, Lucy never returned. She went to her mother's house and on the Feast of the Ascension, 1494 May 8, she put on the habit of a Dominican tertiary. Count Pietro was furious, burned down the Dominican priory and even tried to kill her spiritual director who had given her the habit. Rich and influential, he continued to try to bring her back. Next year Lucia went to Rome and entered the monastery of the Dominican tertiaries near Pantheon. Her sanctity impressed everyone so much that by the end of the year, with five other sisters, she was sent by the Master General of the Dominicans to start a new monastery in Viterbo. 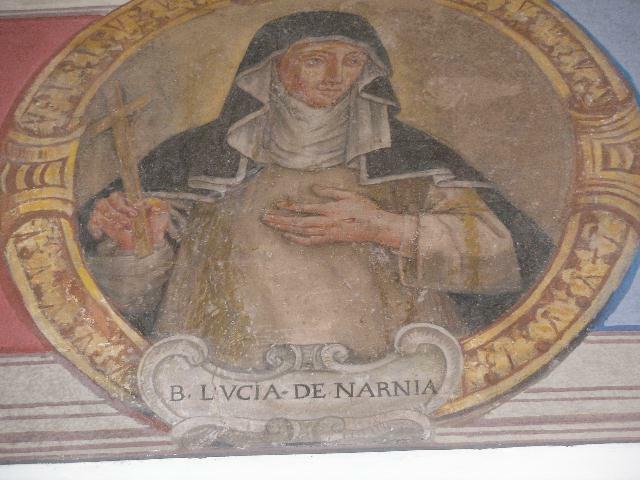 Friday, 1496 February 25, Lucia received the Stigmata, the Sacred Wounds. She tried very hard to hide her spiritual favors, because they complicated her life wherever she went. She had the stigmata visibly, and she was usually in ecstasy, which meant a steady stream of curious people who wanted to question her, investigate her, or just stare at her. Even the sisters were nervous about her methods of prayer. Once they called in the bishop, and he watched Lucy with the sisters for 12 hours, while she went through the drama of the Passion. The bishop hesitated to pass judgment and called for special commissions; the second one was presided by a famous Inquisitor of Bologna. All declared that her stigmata were authentic. Here the hard-pressed Pietro had his final appearance in Lucy's life. He made a last effort to persuade Lucy to change her plans and to come back to him. After seeing her, he returned to Narni, sold everything he had and became a Franciscan. In later years, he was a famous preacher. The duke of Ferrara was planning to build a monastery and, hearing of the fame of the mystic of Viterbo, asked Sister Lucia to come there and be its prioress. Lucy had been praying for some time that a means would be found to build a new convent of strict observance, and she agreed to go to Ferrara. This touched off a two-year battle between the towns. Viterbo had the mystic and did not want to lose her; the duke of Ferrara sent first his messengers and then his troops to bring her. Much money and time was lost before she finally escaped from Viterbo and was solemnly received in Ferrara on 1499 May 7. Later Duke Ercole asked his future daughter-in-law, Lucrezia Borgia, to bring for Lucy's convent eleven candidates from Rome on her way to Ferrara. They arrived a few days ahead of Lucrezia's state entry into Ferrara on 1502 February 2. But the records say, sedately: "Many of these did not persevere." The duke of Ferrara liked to show off the convent he had founded. He brought all his guests to see it. One time, he arrived with a troop of dancing girls, who had been entertaining at a banquet, and demanded that Lucy show them her stigmata and, if possible, go into ecstasy. It is not surprising that such events would upset religious life, and that sooner or later something would have to be done about it. Some of the sisters, naturally, thought it was Lucy's fault. They petitioned the bishop, and, by the order of the Pope, he sent ten nuns from the Second Order to reform the community. Lucy's foundation was of the Third Order; of people who remain laymen even after their vows. The Second Order "real" nuns, according to the chronicle, "brought in the very folds of their veils the seed of war"; nuns of the Second Order wore black veils, a privilege not allowed to tertiaries. The uneasy episode ended when one of these ten nuns was made prioress and when Duke Ercole died on 24 January 1505. Lucy was placed on penance. The nature of her fault is not mentioned, nor was there any explanation of the fact that, until her death, 39 years later, she was never allowed to speak to anyone but her confessor, who was chosen by the prioress. Only now, 500 years later, the situation is slowly beginning to clear. The Dominican provincial, probably nervous for the prestige of the order, would not let any member of the order go to see her. Her stigmata disappeared, too late to do her any good, and vindictive companions said: "See, she was a fraud all the time." When she died in 1544, people thought she had been dead for many years. It is hard to understand how anyone not a saint could have so long endured such a life. Lucy's only friends during her 39 years of exile were heavenly ones; the Dominican Catherine of Racconigi, sometimes visited her--evidently by bi-location--and her other heavenly friends often also came to brighten her lonely cell. Immediately after her death everything suddenly changed. When her body was laid out for burial so many people wanted to pay their last respects that her funeral had to be delayed by three days. Her tomb in the monastery church was opened four years later and her perfectly preserved body was transferred to a glass case. When Napoleon suppressed her monastery in 1797 her body was transferred to the Cathedral of Ferrara and on 1935 May 26 - to the Cathedral of Narni. Yes, there is a small town in Italy, very close to Rome, that bears the Italian name of Narni. Until about 200 years ago, for about two thousand years, it was known only as Narnia. And this ancient name even today still continues unchanged not only in Latin but also in some English books. It certainly continues in the seven books of the "Chronicles of Narnia" by C.S. Lewis, who found this name in an atlas when he was about fourteen years old. The little Lucy of his Chronicles, just like the Blessed Lucy, is also a girl who believes and who can see many things that other people cannot see.